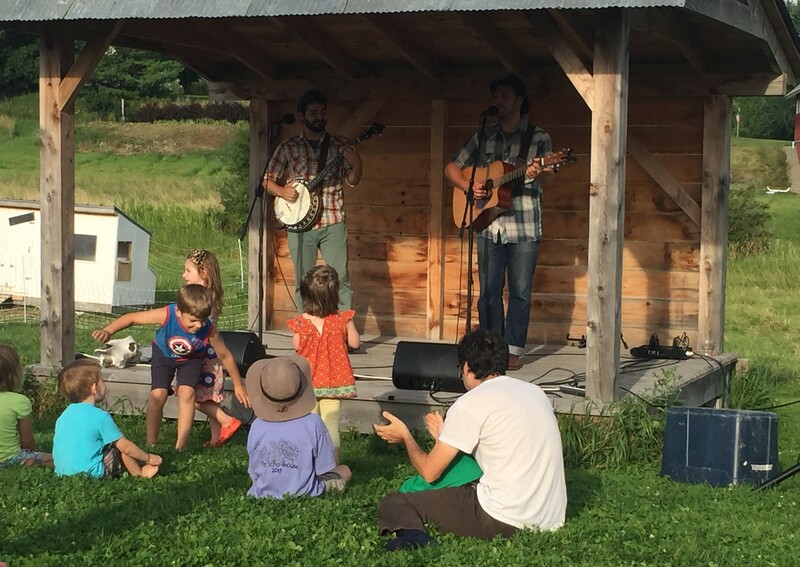 Last night my children and I had the extreme honor and privilege to see the Grammy-award-winning duo The Okee Dokee Brothers perform their first ever Vermont show. 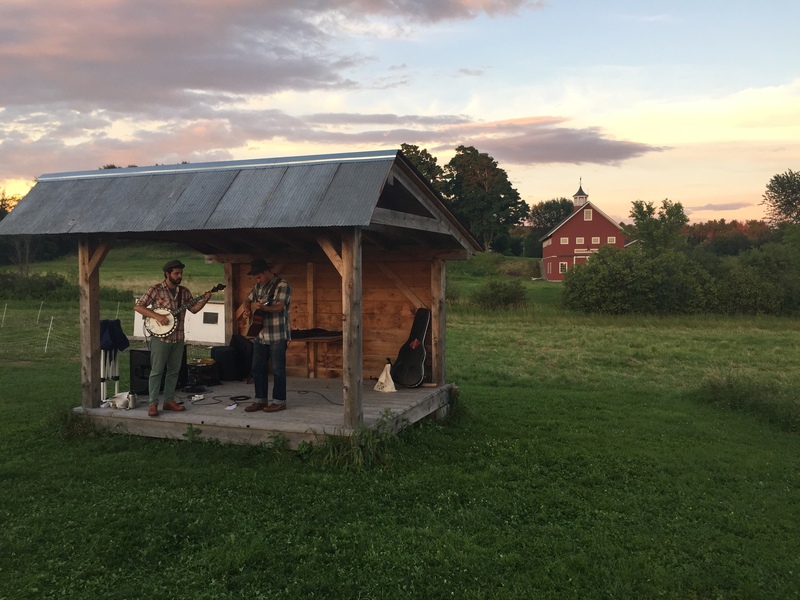 It was a beautiful evening out at Bread and Butter Farm, and though they always have marvelous music and fantastic food there, last night just seemed extra special. We pulled up a cheeseburger and sat down on the grass for some truly excellent folk music, complete with the crazed dancing of children. Is Edward tripping, or dancing? Or… trancing? After the show I was able to sit down for an interview with the “brothers,” Joe Mailander and Justin Lansing, but I didn’t want to ask them the same boring old questions that you can find the answers to on their website. I wanted to know, since I have shared so many of my own here on this site, what are their infamous gigs? Me: So I have a series on my blog called “Infamous Gigs,” where I talk about just the weirdest, craziest gigs I’ve ever done, and we don’t name names or anything, but what is that one weirdest, strangest show? Do you both have the same answer? Tell me a story that’s not on your website. Joe: So in the children’s music world, you get thrown in a lot of… interesting situations. Good and bad, right? Some that you didn’t expect, and you’re at a beautiful farm, and it’s a pleasant surprise. Others, where you might have expectations a little higher, you’re a little… surprised. So what would you say as a specific, Justin? Justin: Do you know which one I’m thinking of? Joe: If not, I can tell mine too, but go for it. Joe: Oh, I have a different one. Joe: But the bookstore one’s great! Justin: Okay, so this was a bookstore that we had been… we hadn’t played too many gigs at this point, right? So we were kind of building up to this gig thinking it was going to be a big deal. The guy who ran the bookstore was passing it around, saying we’ve got a bunch of people from the kindergarten over there coming. You know, we’re putting the word out to the community. Joe: And a girl that we had a crush on was there. Me: You both had a crush on her? Me: How’d that work out? Joe: ‘Cause of course all of our songs are somewhat interactive, and when you have one child doing the interactions while all the adults in the room are kind of gasping for air, it creates somewhat of an awkward energy. That’s a good one. Joe: My other one, just really quick, we are very happy to perform in children’s hospitals. We do it a lot. We are in the atrium sometimes, um, out in the quad, or, you know, garden centers, or whatever, at these children’s hospitals. The first time, though, that we played, somehow we got placed in the waiting room of an actual, you know, level of the hospital where people were… maybe receiving not the greatest news in the world. Joe: You know, diagnosis and all this. Justin: Waiting to be called in to have a doctor’s appointment. Joe: They were tense! And we were put there to ease the tension. Me: Did you know that? Justin: Not until we arrived and then saw what was happening. Joe: They… They! They were dancing around with a bottle of bubbles, trying to cheer people up, aaaaand that didn’t work. Justin: Because the music wasn’t working, (laughing) so we needed bubbles. Joe: (laughing) Soooooo…..bubbles! Anyway, I think a couple people smiled, and then we called it a day. Me: Yeah, sometimes you have to call it a day. Joe: We learned a lesson! Me: I’ve learned that lesson. Those are awesome stories. Thanks! I turned off my recorder, we all thanked each other for being awesome, and the two friends went off to enjoy Vermont for a day or two until their next concert in Lake Placid (which I believe is tomorrow night). Their next album will chronicle their adventures out west along the continental divide, and we were lucky enough to hear them play some of those songs live for the first time. If you get the chance to see them, it will be well worth your evening. And be a good audience. Dance, clap, sing, and laugh. Or else you might end up on their future list of…infamous gigs! 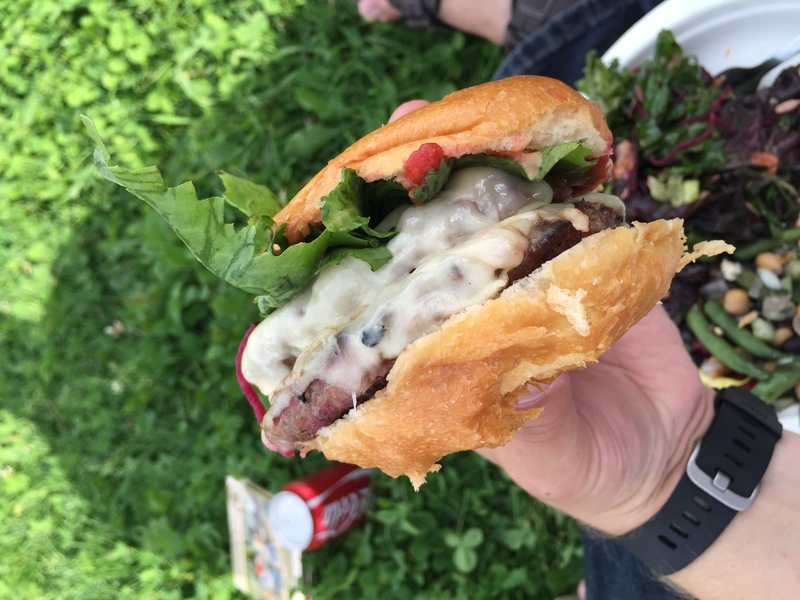 Posted in Cheeseburgers, Concert, Music, Okee Dokee Brothers, Photo, Singing, Tenor Tuesday.